My recent flights to Singapore helped me watch Ocean's 8, but of course that just reminded me that I had never watched the movie they kicked off this particular movie franchise. But we can't cover everything all at once and so I accepted watching the newer movie out of sequence and promised to double back when I had the chance. 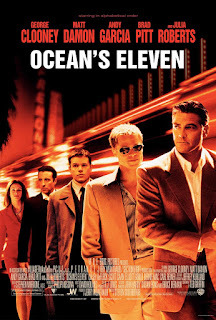 So funnily it was during a subsequent flight that allowed me to finally watch the 2001 Ocean's Eleven to scratch that itch and to help me to better underhand all the references that the spinoff movie had been trying to hit. And man it's quite a list when you get down to it. It was rather impressive how well the movie holds up despite the years as the heist itself was pretty solid. And they really did gather quite the interesting team to bring this movie to life and still juggled all these big name stars sufficiently well in order to still tell a good story. Synopsis: Ocean's Eleven is a heist thriller movie directed by Steven Soderbergh. In itself it is a remake of the Rat Pack movie of the same title released in 1960. The movie begins with the parole hearing of Danny Ocean (George Cooney). But immediately upon his release he breaks parole and travels to California and meets with his partner-in-crime Rusty Ryan (Brad Pitt) with am ambitious idea for a heist in mind. He has the audacious idea to steal from three different Las Vegas casinos at once - these being the Bellagio, The Mirage and The MGM Grand. Coincidentally, these three casinos are all owned by one Tony Benedict (Andy Garcia). But a job this big needs quite the team to pull it off and Rusty quickly assembles a somewhat unusual crew: Linus Caldwell (Matt Damon), a young and talented pickpocket; Frank Catton (Bernie Mac), a casino worker and con man; Virgil (Casey Affleck) and Turk (Scott Caan) Malloy, a pair of gifted mechanics; Livingston Dell (Eddie Jemison), an electronics and surveillance expert; Basher Tarr (Don Cheadle), an explosives expert; Saul Bloom (Carl Reiner), an elderly con man; and "The Amazing" Yen (Shaobo Qin), an accomplished acrobat. Outside all this, Tony Benedict's current girlfriend just happens to be Tess, who is Danny's ex-wife. And thus this feels less about scoring a big hit but instead some sort of act of revenge. Then there is some credit that has to be given in term of how they managed to juggle so many characters for a single movie. Not everyone is fully fleshed out, sure, but it's still just enough that everyone had their chance shine over the course of the heist. And thus the ending is really quite fulfilling given how it all comes together. What Could Have Been Better: There are aspects of the plan that were a little weird like how they went out of their way to work with Saul despite his age and general level of health. It didn't necessarily feel like they needed a con man of his age and stature - just a con man who could convince Benedict's people that he needed to be in their special safe. It felt like an odd bit of sentimentality to have him as part of the heist crew. Then you have Linus who wasn't planned to be part of the team per se but his introduction into the mix of things felt oddly hyped up but didn't really pan out into anything special. In the end he was just another character in the mix of things. TL;DR: Ocean's Eleven is a unique creation of its time and managed to elevate a classic story into something else entirely that just worked. It's not a perfect caper but you don't need to be perfect to be widely entertaining. Thus the movie gets 4 different times Virgil and Turk walk through a scene as if they belonged out of a possible 5.